Blanket Stories: Western Door, Salt Sacks, and Three Sisters is a collaboration with The Rockwell Museum and the greater Corning, NY, community. I was commissioned by The Rockwell to gather stories that tether people to place and community. Each story is represented by a textile in this sculpture. The textiles were contributed in response to a call for blankets and their stories from the community including local residents, the greater Finger Lakes region, and friends of The Rockwell. 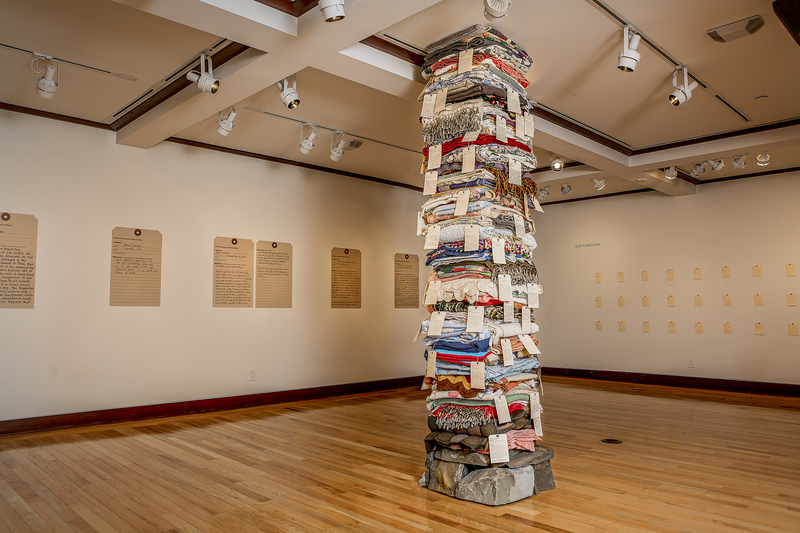 While each blanket in this column represents one person’s story, it also serves as a marker for the collective memory of a larger extended family. Each story communicates the universal nature of our shared human condition and has the potential to unite us. The Seneca Nation of Indians is one of six tribal nations that make up the Haudenosaunee (People of the Longhouse), also known as the Iroquois Confederacy or Six Nations. Historically the western-most tribe of the Haudenosaunee, the Seneca are known as the Keepers of the Western Door. In the context of Corning, NY, and The Rockwell Museum, Western Door acknowledges the long standing presence of Seneca people in Western New York. I was struck by how a humble blanket—made from salt sacks—tells a story about human resourcefulness, a family heirloom, and a regional industry. Salt refineries were a significant part of Western New York’s economy from the late 18th to the early 20th Century. I associate the salt sack blanket story from Helen Sawyer with my mom’s stories of having play clothes made out of repurposed calico-print flour sacks. This salt sack blanket is indicative of the abundance of quilts and their stories collected in this project. They represent the labor—enterprising, creative, and social—of women in Western New York and their immigrant families. Three sisters refers to the Iroquois staple foods—Corn (onëö), Beans (osáe’da’), and Squash (o:nyö́hsa’)—that offer sustenance, both nutritional and spiritual, to Iroquois communities. In the Seneca language they are referred to as Diohe’ko which means “our sustainers” or “they sustain us”. Traditionally, they are planted in a way that Corn’s long stalk creates a support for Beans to climb. Beans contribute nutrients and nitrogen to the soil. Squash, planted at the feet of Corn and Beans, has a broad-leaf covering that protects their roots and keeps the soil moist. When grown together, they thrive; when eaten together, they form a complete protein. This is also a metaphor for community and how we are inter-dependent and related. In this sculpture, I have incorporated three tiers of jingles, traditionally used in pow-wow regalia, to acknowledge the Three Sisters.